He's on 5600 rpm. Smooth enough at that altitude just need some Red Bull doctor. Another pic I found after a quick search..
Spiny Peppercress .It seems the lakebed may be the home to seeds of a rare plant so i wouldn't get your hopes to high ? If I can make this work here's some photos I took from Oct '06. quite a few grazing cattle. Last edited by 1 on dave leaney, edited 0 times in total. From what I've just read on other sites it seems the spiny peppercress is endangered and only found in a few states, even then it is still hard to find at times. Maybe we could offer to try to propagate it and plant lots of it after every event in the SW corner of the lake that looks like the wettest part and may be the best spot for it. Anyone know anything about pot plants? (pun intended!) Other than that the lake looks very good. Thanks to everyone for the new photos. I look forward to hearing what Cled and Spook and anyone else who visits can tell us. Maybe the peppercress thing isn't as much of a problem as we first thought. It's probably seasonal like most plants, so perhaps we could use the lake when it wasn't growing and if the stuff is very rare there's a good chance there'll be little if any of it on the ground anyway even when it's supposed to be there. If we have to have plant experts check the lake before we use it then so be it. If they find any that isn't necessarily an insurmountable problem either because the course could be moved enough to go around it. If we could propagate the stuff (which apparently isn't easy anyway) we'd be smart to plant it all somewhere else! nor is it specifically required to obtain a Planning Permit. More likely it would be deemed not require a permit. Ensure grazing of domestic stock and rabbits does not impact on biological assets. Develop and apply an appropriate weed control program to protect biological assets. Encourage and apply an appropriate fire regime to enhance biological assets. Encourage adjacent landholders to assist in the management of these threats. Encourage local Landcare groups to revegetate areas of the lake with indigenous flora and assist in the control of weeds and vermin. If we were to make application, indicating that we would undertake some form of re-vegetation activity would be a good idea. The last thing we want to do is upset the old Hairy Anchor,hey !! Seriously though, that plant is big, anywhere between 0.5m and 2m, with a trunk up to 150mm thick. It is also extremely rare as it doesn't drop enough seeds to grow lots more plants. Anyway, lets keep digging, we should know about everything that might stop us running there. Dave Leaney said he saw cows on the lake and the report I'm reading says that young shoots are particularly susceptible to rabbits and grazing stock so maybe we should bring some rabbit traps too! From my interpretation of it there is no Native Title Application or Determination over Lake Omeo. From this map I thought it may have been part of the Alpine National Park, but this map from Parks Victoria clearly shows it is not. Do you really think that we would be able to run over any of them plants? I'm betting not. I can hear their loud screams of protest already. 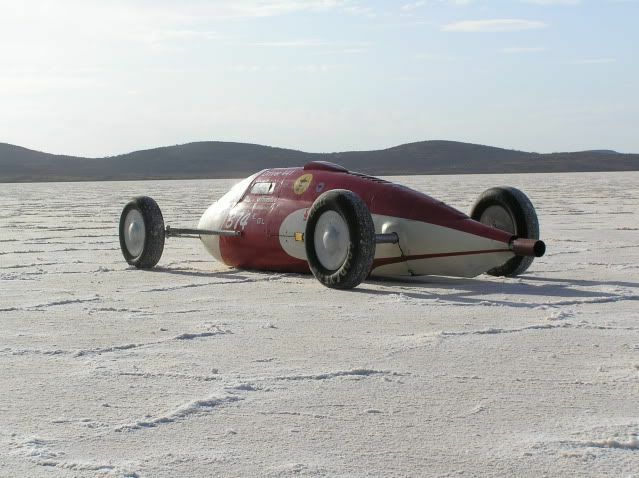 Imagine how many plants would be injured by a pair of skidding wheels of a Dry Lake Racer thundering over the top of them. In saying that, I'm normally an optimist, so unless you ask, we won't know. So lets give it a go.